The advanced methodologies in EDUS programs are based on a system CABAS ® (Comprehensive Application of Behavior Analysis to Schooling). This is a comprehensive educational system that is based on the application of science – behavioral analysis in teaching and solving all the problems and overcoming obstacles in the development and behavior in children and adults. For over 30 years, the science used procedures derived from the principles of human behavior, by which the systematic application can cause changes, or improvements in appropriate social behavior of man / child (language development, social behavior, the development of the game, advancing in subject teaching, spreading interests, development of autonomy, group work, etc.). CABAS ® System, developed by Professor Douglass R. Greer with colleagues from Columbia University in New York, includes not only children but also their parents and professionals who work with them, and studies have shown that this procedure gives a 4-7 times better results than the traditional educational methods, especially in children with developmental disabilities. More schools in the U.S. for over 30 years are using this approach in the education of children with different types of disability, and this is the only scientifically proven method that helps children with autism. Although the basic principles of these methods are applied in a number of European schools, due to the high scientific standards to be met, so far only one has CABAS ® full license (“Jigsaw School”, England), while three schools in Italy (“Tice Learning Centre”) at the University of Parma try to keep CABAS ® classrooms. Also, the school at the University of Oviedo in Spain, is trying to introduce these components of CABAS ® models. In the center of the whole system is still the child- key components (educators, parents, supervisors, professors from universities, professional development, professional training, scientific research) are adjusted to each child and his / her needs and abilities. The system involves the education of children, staff, parents and constantly improving methodology through scientific research. The teaching plans, classes and teaching materials are determined by the individual needs of each student. All behaviors (acquiring new knowledge, (in)appropriate behavior, language development, socialization, etc.) are directly observed and continuously and precisely measured. Constant data collection resulting in clear indicators such as the rate at which a child acquires new social and academic skills, quality of instruction and individual work plan, etc., on the basis of which decisions are made about the future work and the sequence of work. Direct observation / monitoring take place in natural and simulated environments / circumstances. Material or skills that the child independently and spontaneously knows how to use in all these new situations is considered to be learned and that means it’s time for the next goal, ie to upgrade and to present the child some new skills. 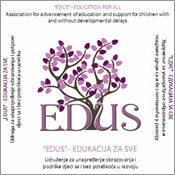 Educators (pedagogues, special education teachers, speech therapists, teachers, psychologists) must use scientifically proven tactics, educational interventions, the principles and methods of work with children to effect the work of each student and provide advancement of each student according to his / her cognitive development opportunities. (For example, students who have not developed vocal communication in a natural way, by using scientifically proven methods, need to learn alternative communication skills). Parent education is compulsory , conducted through lectures, practical exercises and individual meetings in which they get detailed information about the development of their child and the educators indicate how to apply the method at home. Work in the classroom is based on a positive approach, avoiding any form of punishment and negativity.